This page is a secondary repository for files related to the BlueConsole website, with the permission of the father of the products, Larry Cooke. Obtains All Operating Power from Standard RS232 Handshaking Lines - No AC Adapter or Wires Needed! Easy to use Config Utility for adjusting parameters such as Baud-rate, PIN, Device Name, etc. BlueConsole announces support for several new features on our Bluetooth Serial Adapter Products. Support has been added for both the SPP and DUN Bluetooth profiles on all BlueConsole products. The DUN profile is useful for Bluetooth TCP-IP/Internet Access through a Serial Port. We also released two hardware enhancements on all shipping DB9 Adapter products: RS232 support for up to 230Kbs, and LEDs for Monitoring RS232 Tx, Rx, and Bluetooth Connection Status. BlueConsole releases firmware to support a "Bluetooth Repeater" function on BlueConsole2 products. Repeater mode allows customers to extend the operating distance of a standard Class 1 Bluetooth connection using a totally self-contained battery-powered Bluetooth Repeater. Use cases include a Bluetooth Repeater extension between two PC/PDA devices, extending the Bluetooth distance from a PC/PDA to an RS232 device, or extending the distance of two BlueConsole adapters configured for Cable Replacement. See the Application Note: "Bluetooth Repeater" for more details. BlueConsole announces a direct DB9 version of the popular BlueConsole2 inline powered Bluetooth Serial Adapter. This new product shares the same features and benefits as the original BlueConsole2 with a standard DB9 RS232 connection. BlueConsole2 is the smallest Bluetooth Serial Adapter on the market and the only one which can power itself from existing RS232 hardware handshaking leads. It can also optionally obtain power from Pin 9 or from a direct 9V battery connection. BlueConsole announces version 3.7 firmware for Blueconsole & BlueConsole2. This firmware provides the ability to transmit a <BREAK> sequence to your RS232 device. <BREAK> is often used to interrupt an RS232 device for the purpose of password recovery or loading new settings. BlueConsole is the only Bluetooth Serial Adapter that provides RS232 <BREAK> support. See the Application Note: Sending an RS232 <BREAK> for more details. BlueConsole announces a new Windows GUI Config Utility. This utility can be used to Read or Write configuration settings to BlueConsole such as Baud Rate, PIN Code, Discoverability, Device Name, etc. It can also be used to restore BlueConsole to factory default settings. Customers can now configure BlueConsole parameters either from the command line or from this more convenient graphical interface. Configuration can be performed via a directly connected COM port, or over a Bluetooth radio connection. BlueConsole announces new flash firmware which permits MultiPoint Forwarding. With this feature, up to 7 Client devices can be simultaneously connected to BlueConsole and all interact with the RS232 device. BlueConsole is the only Bluetooth Serial Adapter with the MultiPoint Forwarding feature. See the MultiPoint Forwarding Application Note for further details. Network World featured a review of BlueConsole2 in their June 26, 2006 issue. "BlueConsole2 is especially cool because it draws power from the serial port, which means you don't need a power brick." One correction is that the article refers to Bluetooth range as 30 feet. While true for a small cell phone, BlueConsole2 is actually a Class 1 Bluetooth device with up to 100m unobstructed range. BlueConsole introduces the second generation Line Powered Bluetooth Serial adapter - BlueConsole2. 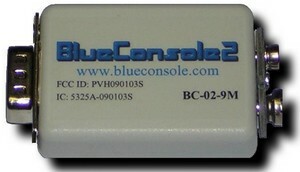 Building upon the success of the original model, BlueConsole2 features both smaller size and lower power operation. BlueConsole2 is 25% smaller and 25% lower power than the original BlueConsole. BlueConsole2 is the only totally wireless Bluetooth serial adapter powered directly from RS232 handshaking leads, without the need for AC adapters, batteries, or special Pin 9 custom power. BlueConsole announces the first and only "line powered" Bluetooth Serial solution. Eliminating the need for serial cables, AC power bricks, or batteries, BlueConsole obtains power directly from the existing RS232 handshaking leads. Its small size and flexible connection options make it a must have tool for engineers that work with telecommunications, medical, industrial, or other RS232 equipment. BlueConsole offers customized solutions for OEM customers. Please contact us at info at blueconsole.com if you are interested in an OEM or Customized solution. NOTICE: Most of the pages, articles, and tutorials on this website are copyrighted works. You may make 'deep links' to various pages. (If you let me know which page(s) you are linking to, I'll let you know if I move the page(s) during updates.) Please send me email if you wish to republish any material, or use it on your own website. Questions? Comments? Additions? Email consoles at conserver.com. How does he do it? And Why?